Perfect for hotels & non-emergency medical transportation. 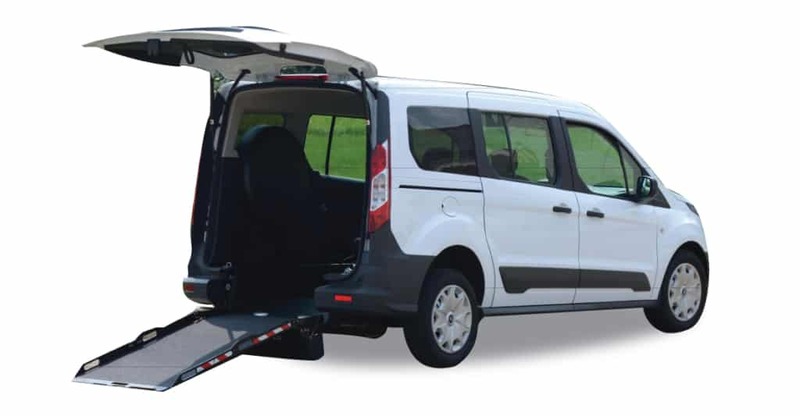 The Ford Rear Ramp Wheelchair Minivan gives you the passenger capacity of a minivan, yet converts to wheelchair accessible in minutes without losing any passenger seating. Built on a Ford Transit Connect, it accommodates 5 plus 1 wheelchair with no need to fold or rearrange the seats. The exclusive Flex-Flat ramp folds flat in the rear of the vehicle to create usable cargo space when not in use. The dual sliding side doors enables passengers to enter and exit with ease. With a Best-in-Class 20 city / 28 highway miles to the gallon, this ADA and FMVSS compliant vehicle is ideal for hospitality shuttles, senior living communities & non-emergency medical transportation.